Description: Knowlton worked for years as a captain on the dive boat TRUTH in Santa Barbara and dived extensively at the Channel Islands. 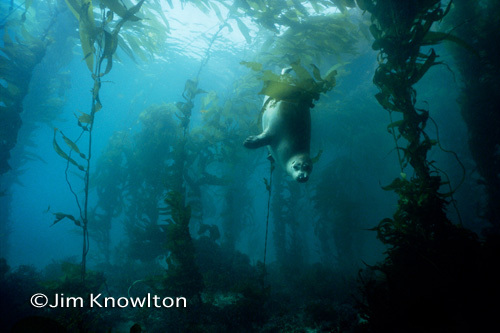 Knowlton says, "while diving in a kelp forest behind Santa Cruz Island, a harbor seal followed me as I photographed the reef. I tried not to pay attention to it and that made the seal more curious and relaxed. At the end of the dive, I turned around and photographed this portrait of my 'new dive buddy' as she hung suspended beside me".